It’s Monday morning, but Susan Yuen and Sheri Chen can be found in their respective Honolulu and San Francisco kitchens, carefully cutting carrot stubs into flower blossoms and placing decorated rice balls into brightly colored containers. These moms are packing bento for their children, a school-day routine. “Bento,” translated to “boxed lunch,” is a Japanese-style lunchbox that incorporates rice, protein, and vegetables into portable, yet beautiful meals. The Japanese tradition has gained a global following in recent years, including some American moms such as Yuen and Chen. While the bento box offers healthful inspiration for parents and their children, the concepts are equally encouraging for any Friedman student looking to freshen up their noontime nibbles. Lunch-box nutrition never looked so good! Susan Yuen packs 2 Tablespoons of peanut butter in a whole grain sandwich, garnished with cheese flowers, nestled with 2 servings of fruit and vegetables, and completed with calcium-rich milk. Re-packing School Lunch. So What’s The Problem? At the Friedman School, the stroke of noon orchestrates the popping of Tupperware tops, often unleashing tangles of local greens, or mingled scents of leftover kitchen concoctions. While nutritious lunches may be badges of pride for many Friedman students, such standards are lacking in many American lunchrooms-and even elementary schools. With nearly 20% of American children ages 6-11 classified as overweight, there has been closer scrutiny of school lunch nutrition standards. Nearly all public schools participate in the government subsidized National School Lunch Program (NSLP), which provides 30.5 million lunches to children every day. Lunches are based on the 2005 Dietary Guidelines for Americans, but compliance is not always perfect. The 2004-2005 School Nutrition Dietary Assessment Study, the most recent national survey reviewing nutrition content of schools meals, found that the majority of sampled schools were providing adequate lunchtime calories and protein. However almost no schools were compliant with sodium recommendations, and NSLP participation was linked to excessive sodium intakes among high school–aged children. Additionally, less than 8% of the sampled schools were providing adequate fiber, and 40% of sampled schools exceeded total fat recommendations. The Japanese bento may provide solutions for lunchtime improvement. What distinguishes the Japanese bento box, and how can it contribute to healthy eating patterns for both children and adults? Early forms of bento originated with ancient Japanese hunter and gatherers, who carried tightly wrapped rations of dried food in bamboo pouches or cloth. However Japan’s modern day boxed lunch hails from 16th century Lord Oda Nobunaga, who portioned out Spartan lunches to his feudal vassals for convenient and mobile meals. His troops soon learned to expect these bento rations, which usually consisted of “musubi” (rice balls) and “umeboshi” (pickled plum) wrapped in a leaf. Today bento is still a useful tool to monitor proper serving sizes. Lunchtime balance includes 1 cup of veggie fried brown rice, 1 poached egg, ½ cup of fruit, ¼ cup vegetables, and 1 pint of milk. Bento is compliments of Susan Yuen. The aesthetic nature of bento requires an array of different foods to create a pleasing harmony of colors, textures, and shapes. Such balance can liven up any lunchbox, and prevent home-packed meals from becoming predictable or boring. 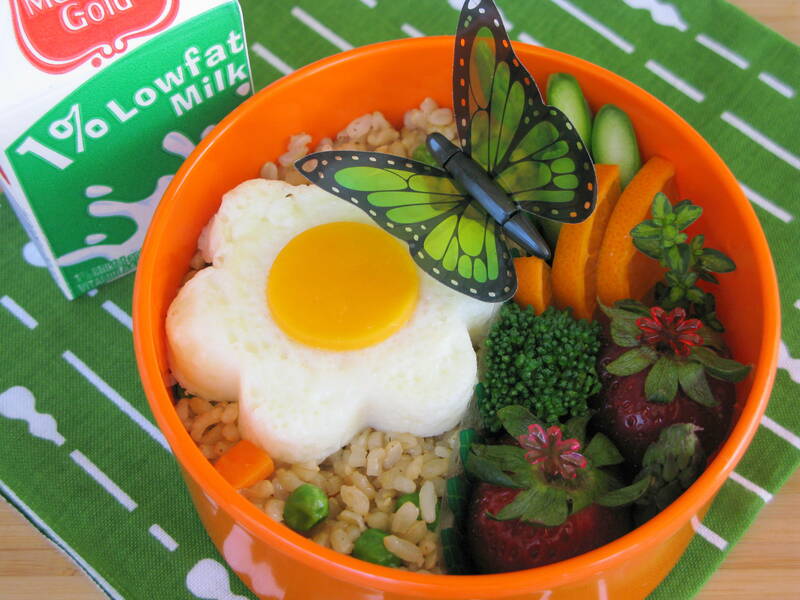 Sheri Chen, another bento making mom, acknowledges that bento can make vegetables fun to eat. “When I make the veggies into something cute like carrot flowers, it [makes] my [kids] interested in it. My girl gets distracted by cuteness, and will eat the vegetable decorations without hesitation.” Chen makes vegetable consumption feasible for her children, often featuring a single carrot, a small broccoli, a few peapods, and a sweet potato flower rather than an intimidating bag of carrot sticks. Additionally, the bento box challenges lunch-makers to new levels of creativity. Susan Yuen has found particular enjoyment in “charaben,” a specific bento style that decorates food to resemble people, animals, or fictional characters. Yuen’s passion eventually led to the creation of her first cookbook in 2008, titled Hawai`i’s Bento Box Cookbook: Bentos and More for Kids. A sequel is due this year. Friedman students, has bento inspired you to upgrade your lunchbox? Even if it’s PB-and-J, try it the bento way! 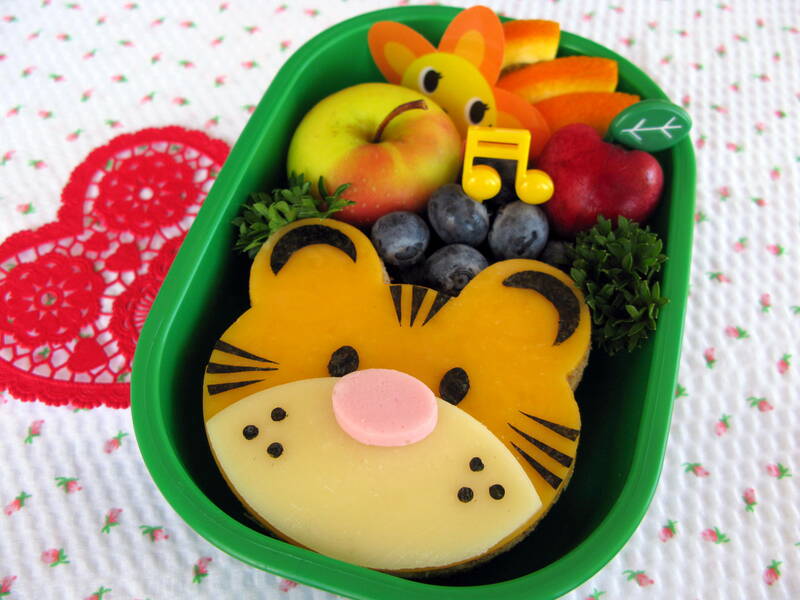 Yuen’s bento illustrates the “charaben” style, where food is decorated to resemble characters and animals. This cheese tiger is decorated with “nori” (seaweed). A bento blogger offers cute inspiration from Indonesia. Bento Central – Featuring bento resources including tutorials, videos, recipes, articles, blogs, and more. Just Bento – Website dedicated to healthy and simple bentos, often with traditional Japanese perspectives. Hawai`i’s Bento Box Cookbook: Bentos and More for Kids. Chen, Sheri. Email correspondence. March 12th, 2010. Clark MA, Fox MK. Nutritional quality of the diets of US public school children and the role of the school meal programs. JAMA. 2009 Feb; 109(2):S44-56. Crepinsek MK, Gordon AR, McKinney PM, Condon EM, Wilson A. Meals offered and served in US public schools: do they meet nutrient standards? Journal of the American Dietetic Association. 2009 Feb;109(2):S31-43. Ekuan, Kenji. The Aesthetics of the Japanese Lunchbox. The MIT Press: Cambridge. 2000, Pg. 188. Miura-Kaminaka, M. The Japanese Cultural Center of Hawaii. The Legacy of the Japanese in Hawai’i: Cuisine. Fisher Printing Co, Inc. 1989.